Hello Day four! I had a decent night’s sleep (I felt tired this morning, even though I got at least 7 hours…must have been all the walking) and had a good breakfast. I’m sitting here in the hotel lobby waiting for the kids to come down with all their gear and board the bus. We will be leaving for Bergen at 9:30. After two days of walking, it will be nice to sit for a bit on the bus. So we’re on the bus on our way to the Bergen cemetery. It is very neat to be driving through the countryside and see a side of the country that you never would. Lots of flat land (the Low Countries, duh) and farms. The aroma of the air really tells you where you are. Bergen-op-Zoom will be the first cemetery that we visit. It should be very interesting to see their reaction today; the excitement will be replaced with solemnity. I’m not sure what my reaction will be. I know in 2012 the first cemetery we visited was at Dieppe and I was quite emotional. Maybe my reaction will set the tone for the kids. We certainly will talk a little bit out the cemetery before we get there. So far on the trip the weather has been very cooperative. Yesterday was very sunny and warm…at times too warm. Today the high is supposed to be around 15C, which might feel even warmer than in Amsterdam since we are away from the sea. I certainly feels very warm on the bus! We are now on our to way to Ypres, which is about 3 hours away. The visit we had to the cemetery was quite emotional. After a brief prayer service at the Cross of Sacrifice, the students proceeded to the soldier’s graves they were assigned. I wish we had more time to spend there, but I think what we had was enough to make an impression. They were very quiet as they left and many (including myself) had tears in their eyes. 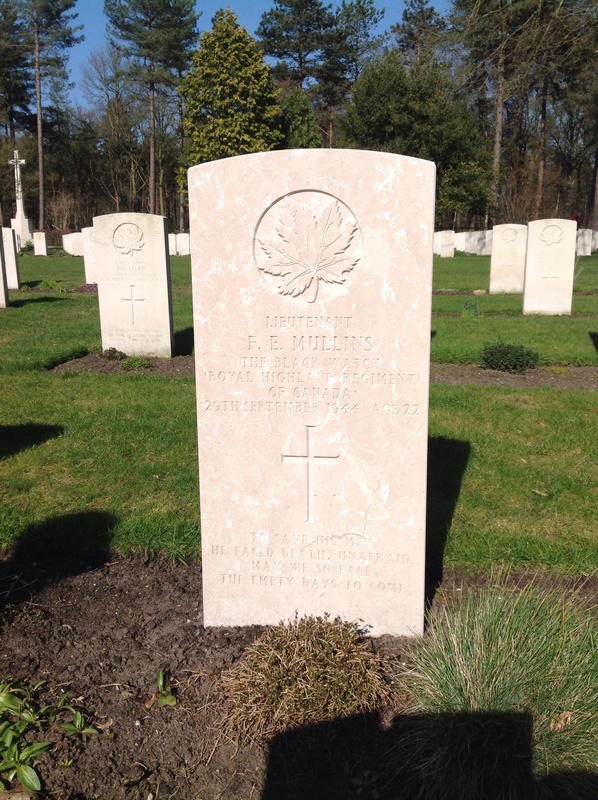 Grave of Lt. Mullins, March 2014. 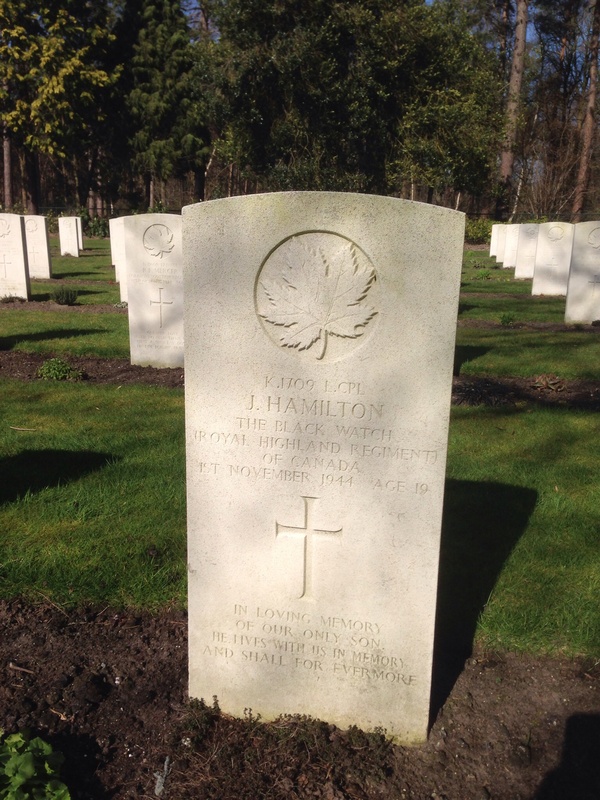 Grave of L. Cpl Hamilton, March 2014. It is always the headstones that get me. As we were leaving, I happened to catch another one that hit me hard. The soldier was a J. Hamilton, who was also from the Black Watch. He was killed on November 1, 1944 and was only 19 years old. His inscription read “In loving memory of our only son. He lives with us in memory and shall for evermore.” As a parent, I have tears in my eyes now. It is now a quarter past nine and we’re back on the bus heading toward France and our next hotel. What another great day. Ypres was a fantastic place to visit! It took us only about an hour and a half to drive from the cemetery to Ypres, and the temperature continued to climb as we did. The bus was showing the outside temp at 20C…20C! Holy cow! For a group coming from Thunder Bay, this is like going to the equator. A few weeks ago it was -45 with the wind and now I felt like zipping off my pant bottoms and going around in shorts! When we arrived in Ypres the first place we went to was the Flanders Fields Museum, which is located in the historic Cloth Hall. The building dates back to the 1400’s, but was unfortunately heavily damaged in the war. It was rebuilt, and now houses this beautiful and informative museum. After going through the museum, Jo-Anne and had time to wander around the town a bit, especially the Grote Markt (as did everyone else). It really gave us a chance to look around and explore the city. Jo-Anne got some chocolate and found some tea. Down the road was the Menin Gate Memorial, which contains the names of more than 56,000 Commonwealth soldiers who are missing. We were there in 2012, but there was no time to look at the memorial; I had no idea it was that large. I had a mission while I was there, and I was able to accomplish it. In my teenage years I served in the Lake Superior Scottish Regiment, our local infantry reserve regiment. I have kept in touch with one of my commanders, Major David Ratz. On our last trip he had asked me to photograph the panel listing the soldiers from the 52nd Battalion, which which was the designation for the unit in WWI. I found the panel and took a whole bunch of photos, so I kept my promise. We walked around a bit more, and bought more chocolate before we met up with the Felicity at 6:00. From there we went back to the memorial in preparation for the 8:00 ceremony. There was a bit of time before it started, so I walked along the Kasteelgracht (Castle Canal) with Felicity until we got to the Ramparts Cemetery. The blooming flowers along the way were great. It is a small cemetery, but very beautiful beside the canal. There are 10 Canadians interred there and I paid my respects. Big ol’ jet airliner, don’t carry me too far away! Well, it depends on how far is too far. Does 6215 kilometres count? If you don’t recognize this, they form part of the chorus of the Steve Miller Band’s iconic song “Jet Airliner.” This time tomorrow I’ll be on a plane across the big pond, but it’s a Boeing 777, not a 707! I cannot put into words how excited I am, even though I did a similar trip two years ago. There are a lot of nerves too; the weather is always a factor and this time there are 22 kids, not 7. Speaking of the weather, it’s actually a bit of a reprieve getting out of Thunder Bay and the lousy weather we’ve been experiencing this winter. 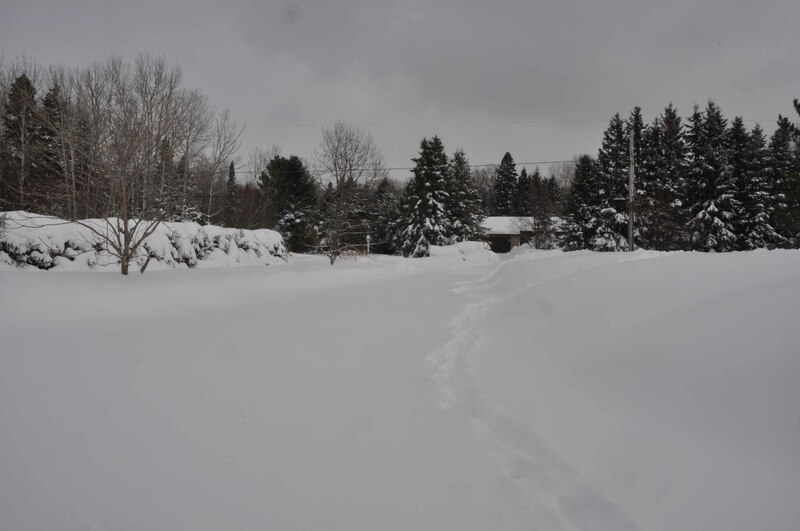 In my last post I spoke about a possible big dump of snow; well, we got that 30cm and more. It was actually enough to close the schools for the day! Cleaning it up wasn’t fun though and it’s hard to believe that with the big yard that I have, the banks were actually getting too high for the snowblower to reach over them. If that wasn’t enough, it got cold again. Last Thursday it was -45C with the wind; I think just about everyone has had enough with Old Man Winter! After the storm, February 2014. 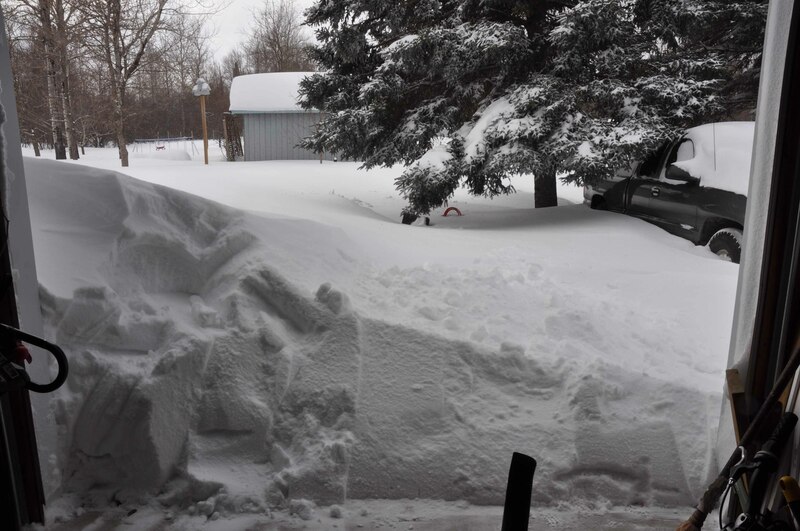 Mountains of snow, February 2014. March break is just around the corner, though it doesn’t feel much like it. The temperatures climbed a bit this week, but I’ve been too busy to notice. There has been a last minute rush of preparations for the trip. There are so many little things to take care of, on top of all the big things. I was burning up the email with my counterpart from St. Ignatius Alicyn Papich as we worked out the fine details before departure. I spent time today getting all of our travellers checked-in via the web, so it’s one less thing we have to worry about tomorrow. I need a vacation from the vacation and we haven’t even left! In the last couple weeks Alicyn and I have been going back and forth via email with our Tour Director Felicity. The tour, Canada’s Battlefields, has a rough template of places we will be visiting, but all the details need to be worked out. Felicity has been fantastic so far, offering many ideas and potential places we can see on each day. Even though I saw some of these places in 2012, I’m excited to see them again. Good thing for it too, as it is helping to displace some of the nervousness I’m feeling…I’m such a worry wart! There are a couple of places I’m very pumped to see. I’ve never been to Amsterdam, so that will be a whole new experience. We were at Vimy Ridge in 2012, but that was with 4000 other people during the 95th Anniversary celebrations and it was rather busy. I’m looking forward to a more relaxed visit. Felicity has also suggested that we take in the Wellington Quarry, which is located just south of Vimy in Arras. When we travel to Normandy, we will be staying at a very neat “hotel.” We were supposed to stay in the city of Caen, but I guess this place had an opening and they moved us. The Chateau du Baffy dates from the 1700’s and was used as a headquarters by the Germans in WWII. It is located only 6km from Juno Beach and reminds me of a little rustic country inn. It will give us a good opportunity to thoroughly explore the Normandy area. I guess part of the reason why I’m excited is the kids. I met with them yesterday at lunch and they were literally bouncing. It is great to see the exuberance of youth! For many this is their first trip across the ocean; for some it’s their first trip in a plane. Most of them will have never been away from home and their parents for so long. I’m sure there is a bit of apprehension mixed in too, but traveling with their friends on the trip of a lifetime will overcome that quickly enough. So with the insanity that has been my life over the last couple of weeks, I have had zero time to devote to any railway work. I was very busy in the last week writing newsletter for the Silver Mountain and Area Historical Society, which went out yesterday. Our annual general meeting is coming up on March 22 and there was work to be done on that. I’m sure when I’m back from the trip and things settle down there will be time to get back on track. Happy Easter! This is the first time I’ve spent a major holiday away from home, so I’m really missing my wife and kids. I’m sure they went to mass in the morning and then enjoyed the goodies the Easter bunny brought. Right now we’re on our way to the Nine Elms Cemetery in Thelus for our cemetery visit. Each student was assigned a soldier to research at a specific cemetery as part of the tour. Should be an interesting event. While I have a moment, I thought I would comment on the experience of eating breakfast in France. I normally eat a bowl of cereal in the morning, so this is quite novel for me. Breakfast has been buffet style, with the usual fair of cereal, fruit and yogurt. What is interesting is all of the cheeses, meats and various breads available. Not a good meal if you’re watching your carbs! After a two hour drive, we arrived at the Nine Elms Cemetery (which is about a 10 minute walk from the Arras Road Cemetery where we parked). It is a pretty little cemetery right beside the highway. Before we visited the graves we held a small service by the cross of remembrance to pay tribute to those that fell. Grave of Private Ecobichon, 15th Battalion, CEF. We were given enough soldiers that I also had one to research. Sidney Ecobichon was born on Jersey in the Channel Islands in 1897. 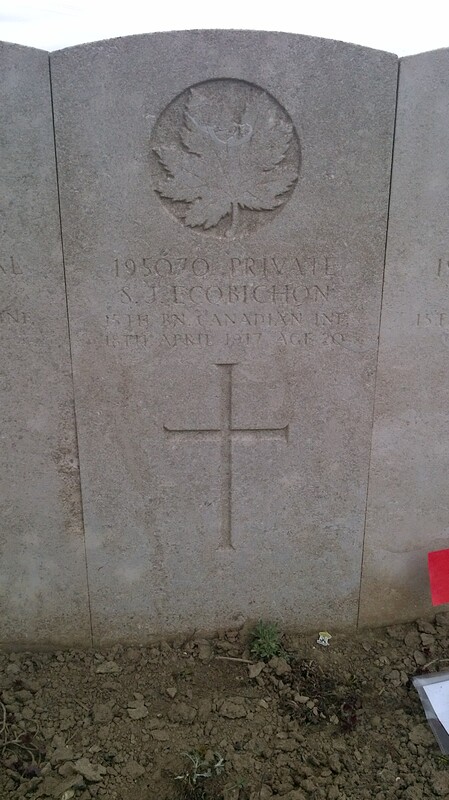 He lived with his parents in Peterborough before enlisting and being assigned to the 15th Battalion. Ecobichon was killed in action on April 18, 1917. I believe he was originally buried in the Arras Road Cemetery, but was transfer to Nine Elms and rests in an area called the Arras Road Memorial. While we waited for the bus, I decided to look in the adjacent farmers field to see if I could find anything. Almost instantly I found a shrapnel ball; very quickly I was joined by several other treasure seekers. It was the most excited I’d seen the kids! We turned up many more shrapnel balls, bits of metal, a German cartridge and I found the base of an artillery shell. Sadly we had to retire to the bus! An hour drive later we arrived at the Tyne Cot Commonwealth Cemetery near Ypres, Belgium (or Ieper). It holds 30,000 burials! The size of this cemetery is just staggering…it almost beyond comprehension. The headstones stretch on and on. It really gives you an idea of how massive the loss of life was during World War One. 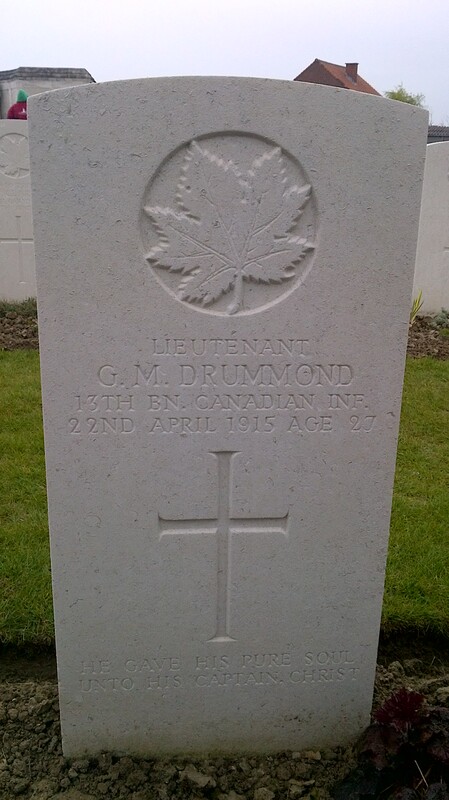 Grave of Lieutenant Drummond, 13th Battalion, CEF. a little investigation. We wanted to look up some Canadians who were buried there. Our collective brainstorming recalled that two prominent Canadians we interred there, Drummond and Norsworthy. Lieutenant Guy Drummond and Major Edward Norsworthy were both members of the 13th Battalion, the Black Watch. They were both killed on April 22, 1915 at the Second Battle of Ypres when the Germans first used chlorine gas. The gas devastated the Algerian troops beside the Canadians, and both officers realized that their entire left flank and the road to Ypres was wide open. They charged into the gap with members of the Watch and surviving Algerians; they were killed holding the line. 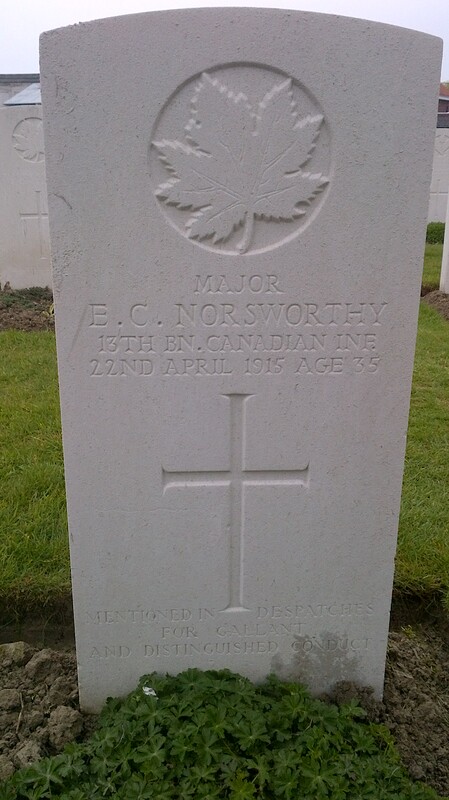 Grave of Major Norsworthy, 13th Battalion, CEF. Supper was in Ypres, at a place called Gasthof Zweerd. There were many other Vimy travellers there, and the square was a sea of black and red jackets. For the first time I left a restaurant full, after our meal of meat salad? and chicken/sausage pastry with fries. We then had a bit of free time, so I headed across the square to buy my wife Jo-Anne some Belgian chocolates. I know she’d rather have something from Tiffany’s but, I did my best. As I walked around, I noticed a sign with the name of the Governor General on it. I then noticed a large Canadian military presence in the square…something was up. Soon a military honour guard assembled, made up of what seemed like infantry reserve members from many units (including the LSSR). 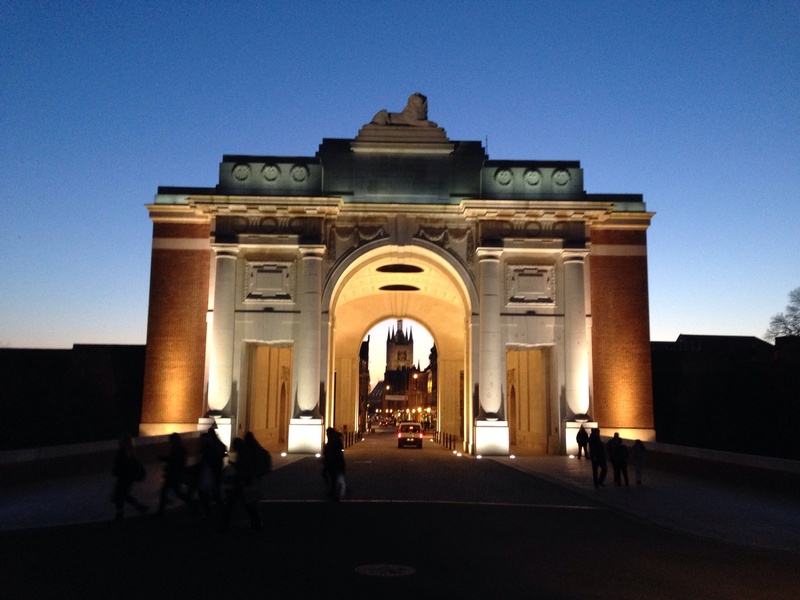 I had to leave as we had to head to the Menin Gate for the Last Post…in retrospect I wish I had left earlier. The area around the Gate, which is a Commonwealth Memorial was already filling with people. The Menin Gate is inscribed with the names of nearly 55,000 men who are missing around Ypres, more than 6,000 of whom are Canadian. Since 1928 they have held a Last Post ceremony everyday at 8:00 at the Gate (with the exception of WWII). The Governor General, His Excellency David Johnston arrived at the Gate preceded by the band of the Royal 22é Regiment and the honour guard. The ceremony was one of the most amazing things I’ve ever witnessed, well other than my wedding and the birth of my children. I spent the entire time taping the ceremony; when I have time I’ll make a highlight video and post it to YouTube. 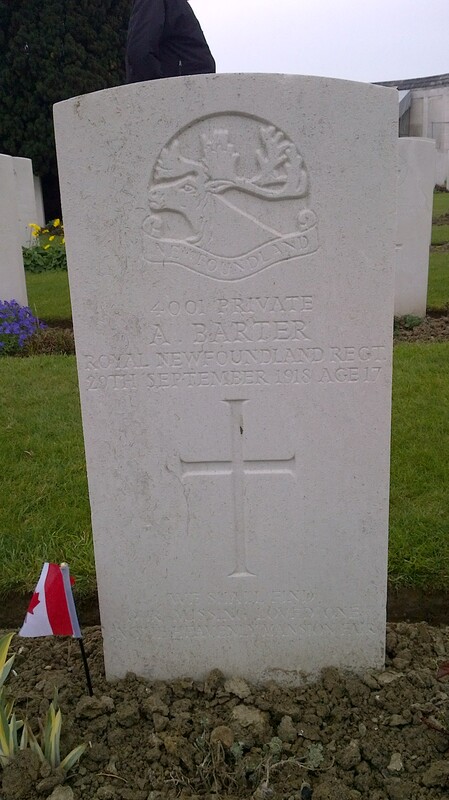 Grave of Private Barter, RNR.